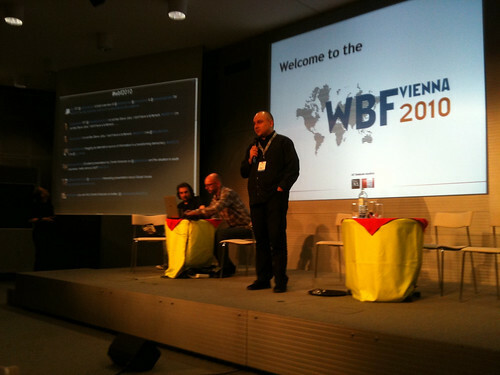 I had the opportunity to attend the World Blogging Forum 2010 in Vienna last weekend and met with bloggers from countries such as Finland, Italy, Republic of Macedonia, Switzerland and Turkey, to name a few. One of the key takeaways from the day for me was that blogging varies greatly across Europe. For example, Werner Reiter, press spokesman for A1 Telekom Austria (the main sponsor of the event), estimated in the initial presentation that there are among 5,000 active bloggers in Austria. Even though this is an estimate and that we do not know how “active bloggers” is defined, it is still a huge difference compared to the rougly 500,000 Swedes that are blogging. The size of the population of the two countries are about the same. Another topic that was briefly discussed during the sessions was how bloggers can monetize their blogs and it became apparent that in contrast to many other countries, the Swedish blogosphere is more commercialized and a far stronger alternative for advertising than in most other countries. This is in part due to the large audiences the blogs attract and that there are services that lets advertisers easily put ads on several blogs. Very few other countries can show the huge traffic that the top Swedish blogs have, with at least five blogs with more than 1 million monthly visits, according to Bloggportalen.se. It seems, not even a large country (with a wide spread language) like France can compete. For example, Eric Dupin who was one of the guests, run one of the top blogs in France. The blog, called Presse-citron, has about one million monthly visits (which of course is a great achievement). So in terms of blog traffic, Sweden is definitely punching above its weight. During the second session, the forum touched upon some more serious topics. Global Voices is a community of more than 300 bloggers who promote voices that otherwise are censored or have trouble being heard. Onnik Krikorian, the Caucasus Regional Director of Global Voices, described how the situation was in his region, which is vastly different from how we in Sweden look at blogs as tools. Onnik cannot call or travel to Azerbaijan because he has an Armenian name, although he has a UK passport. But he can use social media tools such as Skype to reach the neighbouring country. Social media fills an important role in South Caucasus, in countries like Armenia, Azerbaijan and Georgia. His presentation can be found below. View more presentations from Oneworld Multimedia. Global Voices also has a special site that monitors bloggers that are being harassed – Global Voices Advocacy. Among those bloggers are Croatian blogger Marko Rakar (pollitika.com). He told us how he and others worked to expose voter frauds in Croatia. For example, at one point (don’t know the exact year of this election), Croatia had 600.000 more votes than there were voters. Marko helped expose this voter fraud which actually made Croatia change its constitution. See his profile at Threatened Voices. In the picture: Onnik Krikorian, Werner Reiter and Marko Rakar (standing). There was also a great presentation by Matthias Luefkens from the World Economic Forum about Twitter Diplomacy, but since he is attending SIME in Stockholm this week, I won’t spoil it for you by revealing too much (although you can find a video of the presentation in one of the links above). All in all, I’m greatful to have been invited to the forum and it was great to discuss blogging with people from so many different countries. Update: I got some facts wrong and the text has now been updated.